Why not grill up a bunch of burgers in the same way!?! I went digging through the freezer and was surprised by how much ground beef that I had on hand. Perfect for some batch burger grilling! Now we’ve got quite a few burgers in the freezer for a quick dinner, or lunch for the boys. 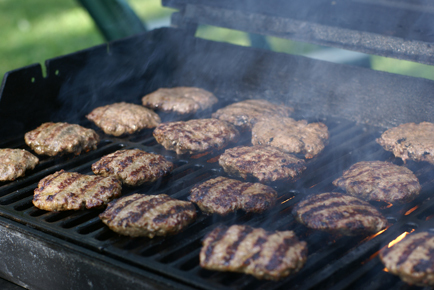 Next time you see a great sale on ground beef…stock up for some batch grilling!!! We do this too! We usually grill something extra every time we grill — brats, hot dogs, chicken, pork chops. Then we freeze the extra food for a quick meal later in the month. Saves a lot of time and you get that great grill taste. Hi! Wouldn’t using frozen meat then re-freezing affect the quailty of the meat. Or is OK to do with beef? I don’t eat red meat but was thinking that the hubs would enjoy doing this for himself. 🙂 I am thinking it might be best to start off with fresh meat. @Angie, Its okay if you thaw raw meat, cook it, and refreeze after cooking. You’re not supposed to thaw something and refreeze it without cooking 😉 Goes for veggies as well! Do they taste good this way? I have never made burgers then frozen them. I do the same thing and make sure I eat the most well done ones right away and microwave the others the next day for lunch add on cheese and there you go. I usually use toasted bread so thats a great way to use up over stocked bread, also when I get orange bell peppers on sale I buy them in bulk , roast them in the oven all at once and then freeze them skinless in smaller blob portions )of course that i is also a grill option while you are grilling as are some veggies for the next day, example sweet potato slices- For the bell peppers I just slice off pieces for use, they heat up easily in a microwave or in a soap or steak sandwich can go in frozen when cooking. Love the idea, but how do you reheat them so that they aren’t all dried out? We’ve done this too. It’s fine to do with frozen meat (I hope) since you’re cooking it before you freeze it. We usually just let them thaw a bit and wrap them in a wet paper towel and heat in the microwave. Unfortunately……I never find myself with extra meat…..my husband and 7 year old daughter are quite the carni vores! I am not sure about refreezing the meat. My Mom always tells me food should only be frozen once. When my DH makes burgers I use fresh meat, partially freeze them on a tray then when they are just starting to go hard put them in a ziploc seperated by wax paper. We do this all the time. Last time, we cooked 40 hamburger patties. The key to freezing is to leave them a little (just a little) undercooked from how you like them. Freeze. When ready to use, microwave them until heated through and allow them to rest one minute in the microwave. You end up with burger just the way you want without feeling like you are chewing on a piece of leather. Hey Sarah…yes, cool completely to reduce water crystals and freezer burn. If you plan to store them in the freezer longer than a few weeks, I’d wrap a few patties into foil, then in a freezer baggie. Hope that helps…and congrats on baby!!! Regarding reheating the burgers…..place a piece of bread that’s been dunked in milk, broth, or water on top of the frozen burgers and wrap them in aluminum foil and reheat in 350 degree oven for just a few minutes….juicy and perfect every time!! !